When people are ready to purchase a home, lots of emphases is placed on the monthly payment and utilities that come with the home. But there is more to owning property than the principal/interest payment and the electrical bill. There are also multiple maintenance items that can take up time and money and these items should also be considered when looking at homeownership. Take a look at the following home maintenance tips to get your home in tip-top shape. These items should be handled every month throughout the year to maximize the longevity of appliances and the home. Kitchen Disposal – If your home is equipped with a disposal in the kitchen, it needs to be cleaned out monthly. Most maintenance experts claim that ice cubes made out of vinegar are the easiest method. Simply pour vinegar in ice trays and then allow to freeze in the freezer. Drop the cubes in the disposal and run through the cycle. The ice will sharpen the blades while the vinegar cleans and freshens the unit. Check Fire Extinguishers – First, make sure to learn how to use the fire extinguisher. Then, each month, check the pressure on the device and ensure that the device is always in an easily accessible area. Replace HVAC filters – Most heating and air conditioning experts agree that changing out the filters once a month will help the unit perform at peak efficiency and help maintain it’s useful life. Filters can be relatively inexpensive and simple to replace. Clean filter for the oven hood – While this will look like a very nasty job, it is easy to handle. Remove the filter from the hood above the stove and place in a large container with some warm water and a degreaser. Most degreasers from the local car parts store will get the job done. Allow the filter to sit for a while in the degreaser solution and then allow it to dry before placing it back in the hood. These items typically last a long time with a bit of maintenance. That is why it is only necessary to check them once every three months. Garage Doors – Garage doors are now required to have an automatic reverse feature. To test, get a piece of wood that is 2 inches in depth, 4 inches in width and about a foot long. Place the wood on the ground where the door should come to a complete close. Once the door comes in contact with the wood, the door should reverse back up. This is also a good time to check the electronic sensors to make sure the door reverses automatically. Smoke detectors – Modern smoke detectors have a test button. Once every few months, press the button and listen for a sound. If the alarm works, put the detector back in place. If no sound emits, replace the batteries and test again. If there is still no sound, replace the smoke detector. Some items only require attention on occasion. Handling these items can prevent expensive repairs down the road. Clean coils on refrigerator – The refrigerator can use a lot of energy in the course of a typical year. If the coils are dirty, it will use up even more electricity. Using a tube and a brush attachment from a vacuum will make this a simple job, once the refrigerator is moved out from the wall. Relief valve on water heater – checking the pressure relief valve on the water heater will allow the appliance to operate better. Checking the valve will also safeguard against corrosion. Replace all batteries in smoke detectors – This is different from the previous tip. In the earlier tip, we suggest testing the smoke detectors every quarter to make sure they work. Now, we are recommending that all batteries in all smoke detectors be replaced every six months. With the cheap price of batteries compared to the price of a home, this is a good investment twice a year. By maintaining a home, the property will not only last much longer but can also save the homeowner some expenses in the future. 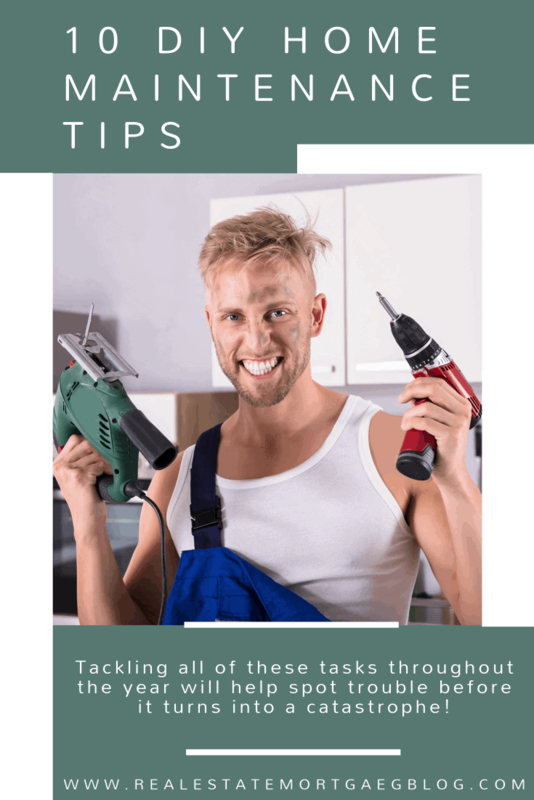 About the author: This article on 10 DIY Home Maintenance Tips was written by Luke Skar of www.MadisonMortgageGuys.com. As the Social Media Strategist, his role is to provide original content for all of their social media profiles as well as generating new leads from his website. www.MadisonMortgageGuys.com provides award winning customer service to clients who need to purchase a home or refinance an existing mortgage. Our branch currently serves Wisconsin, Illinois, Minnesota and Florida. On our website you will find state specific mortgage program information for all states listed, as well as general but detailed mortgage program guidelines. Great tips for homeowners. As long as they are somewhat handy. And, remember, YouTube has wonderful tutorials on doing almost everything. It’s amazing how many times I’ve gone to youtube for a tutorial. Being somewhat handy helps but even for those who are not, there’s still a lot they can do and learn!